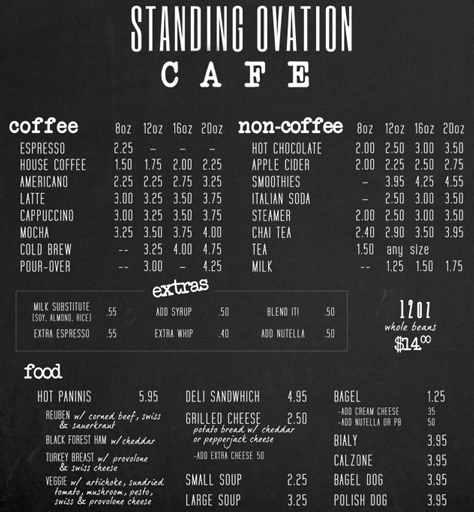 Our Standing Ovation Cafe is a full service coffee shop featuring STUMPTOWN COFFEE! Running late and didn’t have time to stop for lunch? Need a place to relax during your children’s music lessons? The Standing Ovation Café offers our customers the perfect place to grab a quick bite or unwind with your favorite latte or tea. It’s also a great place to reward your children after working so hard on their lessons! We serve drip coffee, espresso and all specialty coffee drinks. Also Oregon Chai tea, Italian Steamers, Hot Chocolate, Smoothies and more. Our Baristas are "Stumptown Certified". We have a great candy, chip, and snack selection; including local Killa Bites, and Vancouver Toffee Company. Need something more substantial? Try Molly's local and (mostly) organic salad, sandwiches, wraps, or breakfast sandwiches! Soup, paninis, and deli sandwiches are also available!